Ross Hinscliff has been fighting for better treatments for gastro-intestinal cancers since his wife, Jeanine, was diagnosed in 2014. Jeanine lost her battle with a rare gastro-intestinal (GI) cancer last July. Ross continues to fight for better treatments for these cancers in her memory, and to set an example for his two teenage kids. Gastro-intestinal cancers are devastating. Only 49% of patients live longer than five years after being diagnosed. This is much lower than the 5-year survival rates for other cancers, such as breast cancer (90%), and prostate cancer (92%). 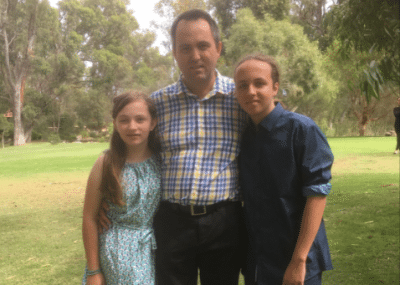 Despite the challenges of now being a single-dad of two teenagers, Ross has taken this very ‘gutsy’ challenge to another level, committing to trek over 65km through the Tasmanian Wilderness to honour his wife. He is truly committed to raising awareness and much-needed funds for research to help others in the future. You can find out more about Ross’s trek for GI cancer research here.